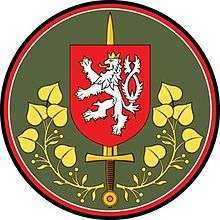 The Czech Land Forces are the biggest and decisive part of the Army of the Czech Republic. In coordination with other services they are organized to defend the national territory. Under a crisis situation and in the event of hostilities they form the core of operation task force of the allied joint force and eventually they are complemented by mobilized units. The Land Forces are also designed for fulfilment of commitment in compliance with the Article 5 of the North Atlantic Treaty and tasks in favour of the state administration authorities. ↑ "Land Forces". Ministry of Defence and Armed Forces of the Czech Republic. Ministry of Defence. Retrieved 27 May 2016. ↑ Šimůnek, Petr, ed. (July 2015). "Land Forces". The Long Term Perspective For Defence 2030 (PDF). Prague: Ministry of Defence of the Czech Republic - Military History Institute (MHI). p. 13. ISBN 978-80-7278-667-1. Retrieved 14 November 2016. ↑ "Land Forces" (PDF). University of Defence. Retrieved 14 November 2016.